Forum asks: What's next for NAFTA? When: Nov. 8, 8-9:30 a.m.
After four rounds, negotiations to modernize the North American Free Trade Agreement have taken an acrimonious turn. Disputes over rules of origin and other key provisions affecting the automotive trade have dimmed hopes for compromise, and industry leaders are confronting the very real prospect that NAFTA may unravel altogether. So what happens next? Can NAFTA be saved? If so, how? And if not, how will the economics of automaking be transformed? 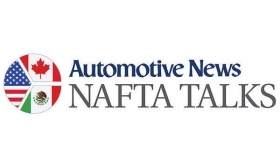 Automotive News will explore these questions in NAFTA Talks, a high-level forum for automakers and suppliers, Nov. 8 in Detroit. Panelists are Emilio Cadena, CEO of Mexican consulting firm Grupo Prodensa; Kellie Meiman, managing partner at McLarty Associates and former official with the U.S. Trade Representative's Office; and Flavio Volpe, president of Canada's Automotive Parts Manufacturer's Association.